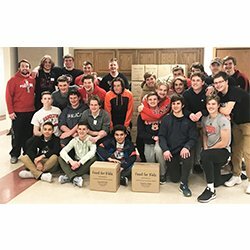 Chargers football players volunteer for hunger relief - Hamilton School District. Hamilton High School Chargers football players did their part to relieve hunger for others. The players volunteered at Christ Our Savior Church and packed 6,912 meals that will be sent to feed the hungry in El Salvador. They were supporting the Food for Kidz organization. The players have opportunities to volunteer as part of the football team. They are expected to accumulate volunteer hours throughout the year to develop personal growth and leadership skills. “We feel strongly about our volunteer opportunities as team-bonding activities that will leave a lasting impact on others,” said Hamilton Football Head Coach John Damato.